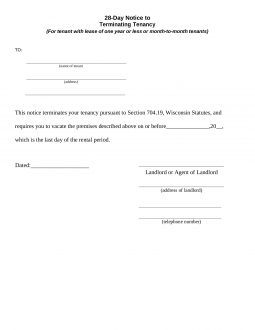 The Wisconsin Lease Termination Letter Form (28-Day Notice) is a legal document that may be used by a landlord or tenant to provide at least twenty-eight (28) days advance notice for their intention to cancel a month to month lease. This document would allow the landlord to remain in compliance of state law and the landlord’s initial contract. Once the document has been completed, the landlord must deliver it, or have it delivered to the tenant(s).